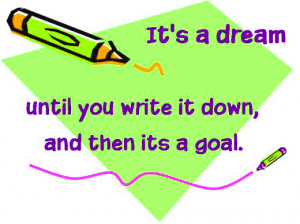 There are so many goals that we all want to achieve. Some short term and others long term. For example if you say you want to loose 2 lbs in 1 week why are you eating chips, candy and drinking soda all week . Those daily activities DO NOT match your overall goal. SHORT TERM GOAL: What goal would you like to attain within the next 21 days? LONG TERM GOAL: What 1 to 3 goals would you like to attain within the next 6 months to a year? Above doesn’t ask you to take any action yet it just ask you to write down your goal(s) and make it visible to yourself. Seeing what you want on a daily basis will subconsciously cause you to think about what you wrote down. These are goals you wish to accomplish not anyone else so you are suppose to get pleasure from seeing what you want and think of ways you can make it happen. Let’s get these goals on a roll. Take this small action towards your goals.